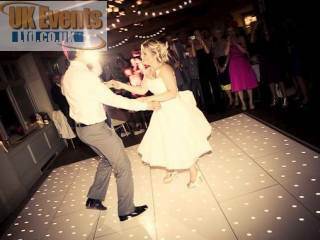 Why not book one of our stunning starlit dance floors to go with your lighting package? 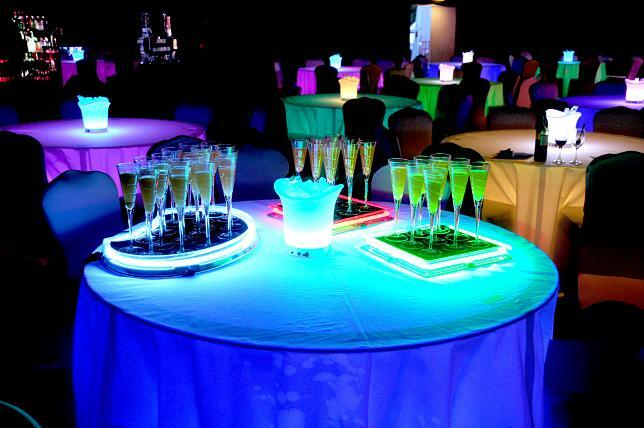 If you are looking to wow your guests, why not look in to hiring our 5ft round colour changing banquet tables? 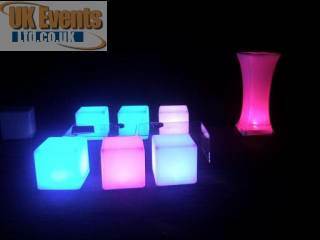 Funky colour changing cubes can be use as seat or as small tables. UK Events Ltd has been trading since 2009. We started our company because we saw a large gap in the market for dance floor solutions. Year after year we have grown our stock levels, reputation and customer database to being the largest specialist events hire company in the country. Not only to we offer 11 styles of specialist floors but we offer many the products to transform any function room. Our core business is wedding receptions, corporate function and birthday parties. We will take on any style of function and transform the room to your liking. Over the years we have built up a reputation of excellence. We constantly monitor all the jobs we carry our and send each client a customer feedback form to fill out and return to us. You are in safe hands when booking any products with us, We use our own products and in-house technicians to install our fabulous products.